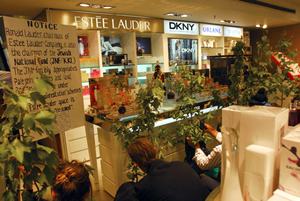 International activists today occupied a Greek branch of luxury cosmetics store Estee Lauder in protest against its chairman’s involvement with Israeli ethnic cleansing and occupation in Palestine. This is the latest in the growing campaign against the Jewish National Fund (JNF), a Zionist organisation which facilitates the transfer of Palestinian land to Jews while parading as an environmental charity. 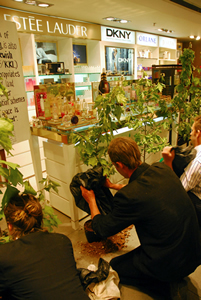 Six members of performance arts group Land Annexation Society entered the store in Thessanoliki, Greece dressed in suits as members of the JNF and proceeded to “plant” trees over the Estee Lauder shop space on Saturday, 28th May. 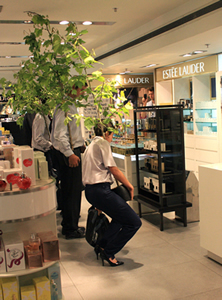 Flyers were distributed to shoppers and staff informing them that “this Estee Lauder space is currently being rezoned”. The action comes a day after the JNF hit the headlines in the UK, with British Prime Minister stepping down from his honorary patronage of the organisation following a letter from the Stop The JNF. 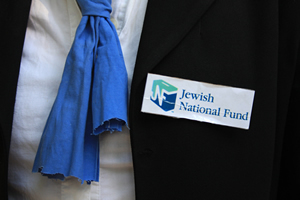 This followed calls in the UK Parliament for the JNF’s charitable status to be revokedi. Following the establishment of the state of Israel, the JNF was given responsibility for developing lands expropriated by the government – including 531 Palestinian villages destroyed in a campaign of ethnic cleansing by the Israeli state. According to the Stop The JNF campaign, parks and forests have been planted in order to cover the traces of villages destroyed in 1948 and 19672. Additionally, it is accused of aiding the illegal confiscation of Palestinian lands on the basis that the owners were “absent”3. Currently the JNF is involved in land and water theft from Bedouin communities7 in the Negev and illegally acquiring lands and houses in occupied Jerusalem through its private subsidiary Hemnuta8. Eli Greenbaum of Land Annexation Society said: “The JNF is an organisation driven by a racist ideology according to which land in Israel and Palestine is the exclusive reserve of Jews. It plays an integral role in the Israeli state’s illegal colonisation of lands yet tries to conceal its activities under the mask of an environmental charity. “Our performance today is intended to bring to the attention of Estee Lauder workers and customers, and an international audience, the JNF and Ron Lauder’s complicity in this ethnic cleansing”. For more details contact Joe Phillips on 00 30 699 646 1662.